Empowering: this is one of the most common words I’ve heard used to describe the Advocacy Summit from those who have advocated in the past. I can still think back to the very first time I attended a congressional meeting. I walked in, uncertain of what was to happen. I found that with each word I spoke, I was more and more encouraged. I saw the impact of my voice, the genuine care each congressional office gave us and I realized that I wasn’t alone in this feeling. No matter what side of the political spectrum one resides on, ending slavery is an issue that we can all agree on. Lobbying for this is empowering; your voice matters and truly, it does make a difference. 2. God is looking for advocates. He is looking for people who are willing to use their voices to speak on behalf of the widow, the orphan and the oppressed. God can do this on His own, but instead He lets us join Him in this justice calling. He mobilizes the church to speak up for those who will never have the opportunity to enter the halls of power. Through advocacy, we all get to play an active role in bringing forth the Kingdom. With every meeting, there is a sense of urgency as one thinks about who they are speaking on behalf of: the widow in Uganda, the young girl in Thailand, or the little boy in India. God is looking for advocates, and we all get to play a part in leveraging our voices to eradicate slavery. 3. Make friends who have a common passion. It is a special moment in which advocates from across the country get to all be in one place at the same time. This is such an incredible time to be able to connect with people who may not be as accessible (geographically speaking) and to share stories and experiences. Not only that, but getting to connect with IJM staff who support the mobilizing efforts in your region is a joy. From coast to coast, the Advocacy Summit brings people together to speak up for the end of slavery, and by coming, you get to experience a powerful sense of community. 4. Experience the heart of the nation’s capital. Being on Capitol Hill is nothing short of inspiring. Washington DC is bustling with life. Looking up at the Capitol building as you enter reminds you of so many historic change-makers who have entered before you. It is an opportunity that does not present itself every day, and one that is truly unforgettable. This is where change is happening -- and you get to be right in the midst of it all. 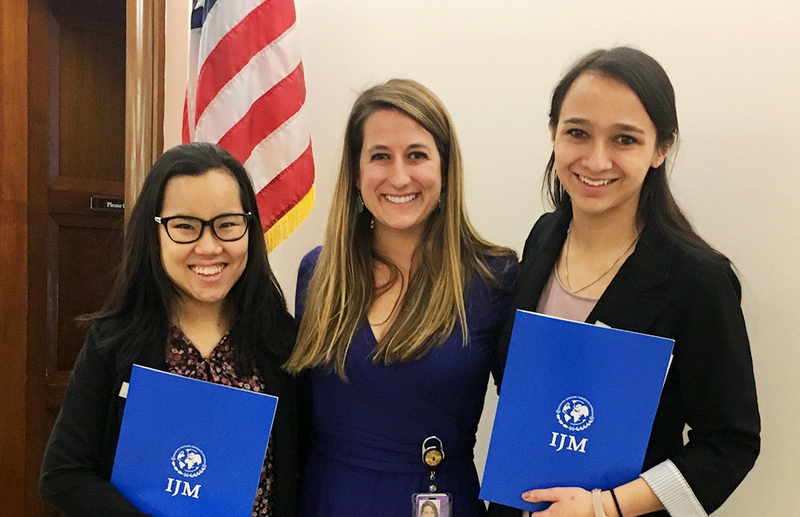 We are in a pivotal time in history as the End Modern Day Slavery Initiative (EMSI), a whole new approach to ending this injustice, is in full swing. With the EMSI being authorized in December 2016, it’s extremely important for us, as ordinary citizens, to use our voices to boldly ask our congress to fully fund this bold initiative. Our collective efforts over the years (petitions, in-district meetings and phone calls to your congressional offices) have made prodigious impacts and this Advocacy Summit will too. We need you, your voice and your passion for justice. Join us this October 23-24 as we join together to speak on behalf of those currently enslaved around the world. Your voice matters. Pssst... if you register by August 12, you can pick up a discounted early bird ticket!